It could be quite a headache if a practical tool cannot be found when we want to add sound track to the video. A proper audio track can definitely enrich the video content and make it an impact. Thus, we are here to show you how to add audio to video like a professional. Don’t be jealous of the videos on YouTube or Facebook, you can do it as well after learning the following methods. ApowerEdit is an expert in the field of video editing. This software enables you to create your own professional videos in so many ways, such as trimming, cutting, splitting, adding subtitle, and of course, adding sound track. Let’s check out how to add audio into video by ApowerEdit immediately! 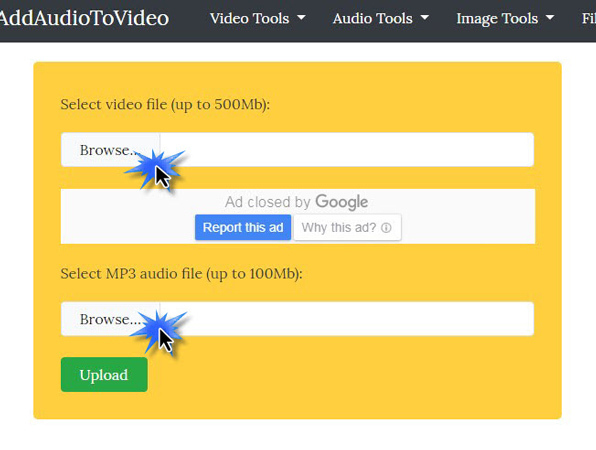 Launch the tool and click “Import” to input the video and audio files. Put your mouse cursor at the edge of whole sound track till the “left and right” arrow shows up, then, you can drag and change the length of it. Or, you can choose the sound track and drag it as a whole to move its place. 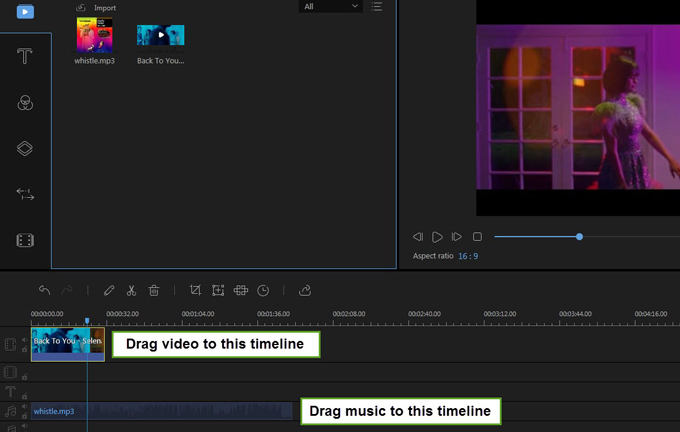 Once the audio adding is finished, click “Export” at the top left menu and select “Export Video”. 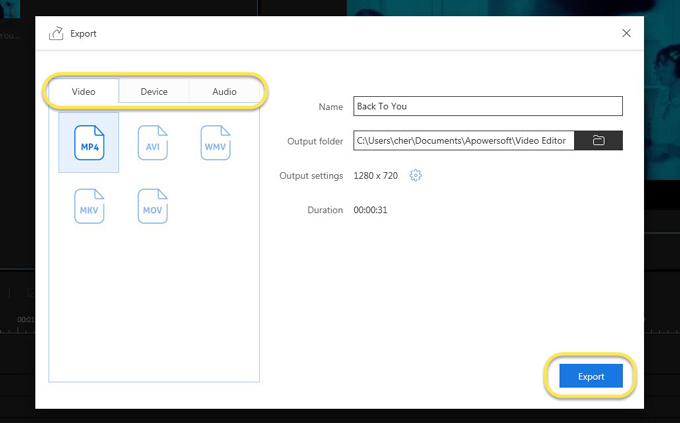 Now, you can further to make an adjustment on the output settings, such as the the format of video or audio, the device type, file name, saving location, etc. 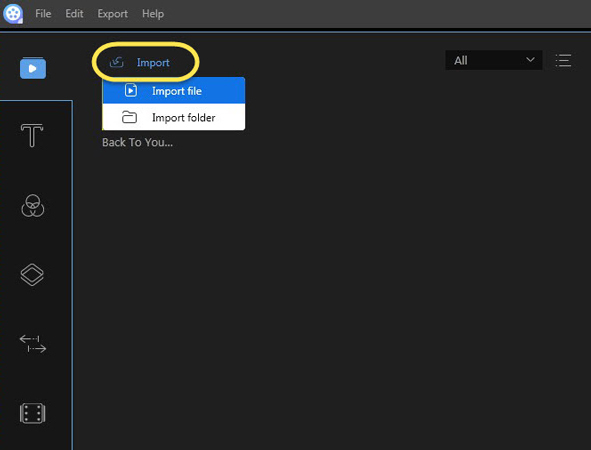 Finally, click “Export” to complete the last step. Don’t be confused. “AddAudioToVideo” is exactly the product’s name. This tool is a completely free and online video audio merger. 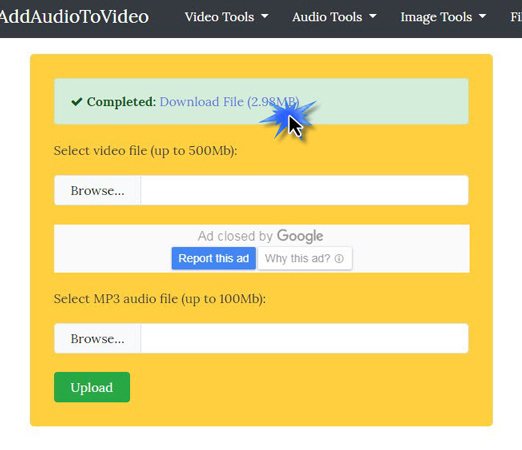 Although you don’t need to download the desktop program to do the job, AddAudioToVideo doesn’t have the whole set of services to help you in editing the video except for adding the audio to video. Anyway, let’s check out how simple and quick it is! Go to the official website of AddAudioToVideo. Click the two “Browse” shown below and choose your video and audio file separately → tap on “Upload”. Wait for a few minutes till the process is completed. Then, click “Download File” to get your merged video. Done! ApowerREC is a professional screen recorder which can help you to record all the desktop activities, gameplay, web meetings, etc. This program now has launched the version of Windows, Mac, Android and iOS, and it enables you to record both system sound and microphone at the same time. Therefore, adding audio to your video while screen recording would be so much easier. Launch the software. Next, click on the sound icon and choose to record the system sound, microphone, or both. Then, hit the red button saying “REC” and the recording will begin. Moreover, this screen recorder has a completed recording setting, such as full screen recording mode, customized recording area, PC screen and webcam recording mode, task scheduler, etc. You are free to check out this guidance for more of its powerful usages. With the above three tool, merging music to video or adding other soundtracks to video won’t be a problem anymore. If you have a quite high demand for the video-audio merging, ApowerEdit can be a nice choice. And if you want to add audio only, then the second tool would be much more simple and fast. As for the third tool, it fits for people who has a requirement of adding system sound & microphone during screen recording. Simply choose the one that fits you the best and enjoy the editing!